Yeah, paint jobs are pricey, but oh how that hull shines afterwards. Fix It or Flip It? If your boat’s getting a little tired, should you refurbish, or sell, and put the cash into a new one? Here’s some insight to help you decide. This morning I looked in the mirror and saw my grandfather, an odd event, since he’s been dead for 50 years. After a moment of brief confusion, however, I realized the wizened visage staring back at me wasn’t Pops, it was me! What a relief: I don’t handle ghosts well before I’ve had my morning coffee. Of course, turning into your ancestors is certainly a lot better than joining them, but then again, there’s not a whole lot you can do about the process of getting older, even if you’re a young-at-heart guy like me. But is there something you can do when the aging process involves your boat? Consider the following, admittedly personal, questions: Are your engines wheezing like asthmatic plow horses, or leaving an Exxon Valdez oil sheen on the water? Do you break a sweat even when your air conditioner’s going full-bore? Do your bilge pumps run a lot more often than they used to? Does walking on your delaminated foredeck sometimes remind you that your kids want a trampoline? 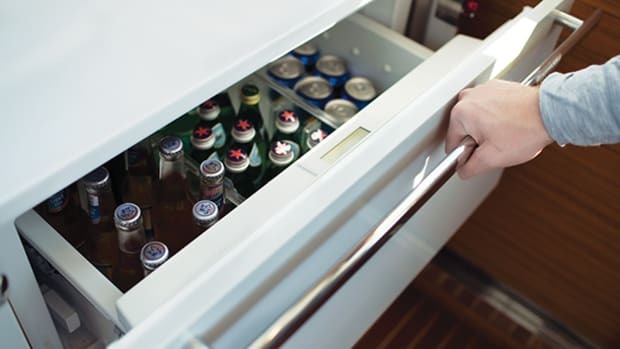 Are guests commenting on your “retro” galley and your “quaint” cabin styling these days? Are museum curators asking you to donate your electronics? Do you pump your head by hand? Is there a suspiciously earthy aroma around that holding tank? Here’s the good news. If you think your boat deserves some kind of resurrection, you can count on the fact that the project won’t be even remotely as foreboding an activity as facing the Great Unknown, although, if you value your bank account, it’s not going to be a laughing matter, either. But hey, unlike our aging bodies, we can fix up our boats, often to a point where they’re way better than they were when we first bought them. And, if we’re not into a fix, we can flip them in favor of something brand new and shiny. But which path should you take? Fix it, or flip it? Here’s some advice on how to decide. Powerplant looking a little frowzy?Even modest efforts at a cleanup should work wonders. So the fix-or-flip thing really comes down to one question: Do I like my boat well enough to invest major cash in its repair? To truthfully answer this question you may want to ask yourself another: “How much will it cost to fix my boat vs. replacing it with one that will give me as much pleasure as I get now?” If your boat’s structurally in good shape, but needs just a little engine work, or some cosmetics, or maybe a system or two upgraded, etc., I’ll wager that the flip will cost way less than the fix. But if you love your boat, the answer is clear: Fix it. On the other hand, maybe you and your boat have drifted apart. Maybe your needs have changed: The kids grew up and moved away, for example. Or you’ve had more kids and need a bigger boat. Or you’ve married a Vegas waitress half your age and she wants to go fast. Maybe you just don’t want to deal with involved repair issues (I don’t blame you; I don’t like them, either). So go for it—flip the old ark for a new one. You can finance the purchase over many years, rather than pay for costly repairs out of pocket, in the near term. 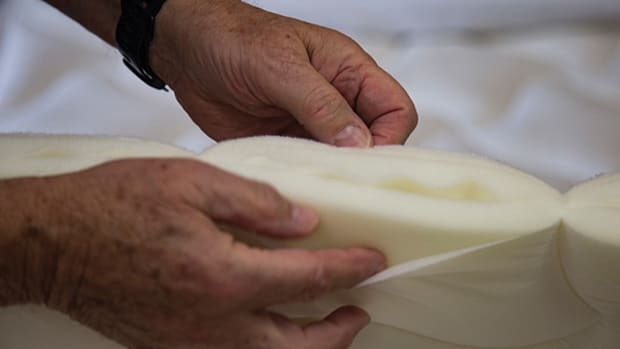 You’ll be doing a good turn for the economy, too: Boatbuilding provides a lot of jobs in the U.S., many in areas where folks depend on those jobs. 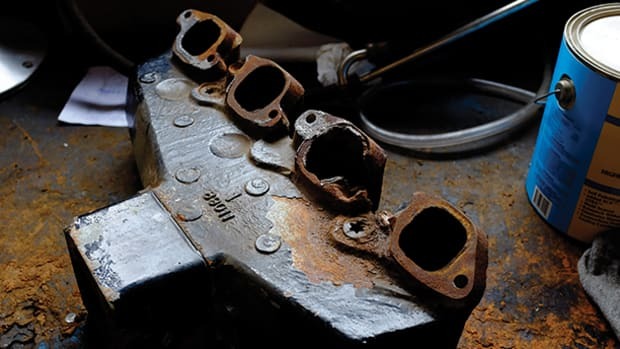 Polishes and stronger products like Ospho Rust Treatment often make metal look new. If you’ve decided to fix your boat, draw up a game plan, listing what needs repair. Things that prevent you from using your boat, or that make every outing an adventure, are at the top of the list, less important stuff at the bottom. You can leave it for next year, or the year after—does anybody really care if your hull doesn’t shine like silver in the sun, or your cushions aren’t as comfortable as they could be? I don’t think so. Structural issues should take precedence, followed by engines and related machinery, electrical systems (faulty electrics not only cause problems with everything else on board, but can also start fires), comfort systems (like air-conditioning units and appliances), and so forth. Your yard manager can help you make the list, and estimate the costs. 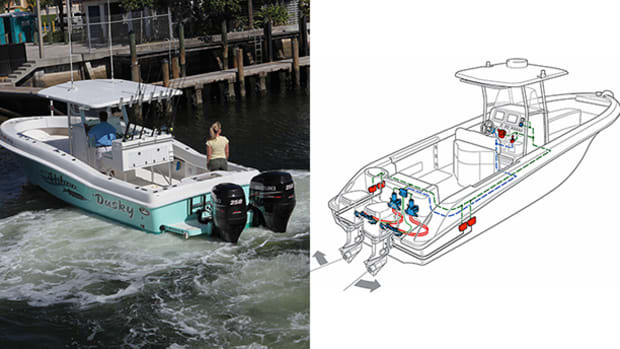 Before starting major repairs, have your boat inspected by a certified, experienced surveyor; ask him/her to focus on the boat’s structure, looking for, among other things, water intrusion, core delamination, damage to the hull and deck supports, transom issues (common in stern drive and outboard boats, especially older ones with wooden transom cores), and integrity of the hull-to-deck joint. Serious structural problems can turn a “fix” into a “flip” pretty quickly: They can be very expensive to repair. Hire a mechanic to check the engine(s) thoroughly, test compression, take oil samples, and so forth. Unless your powerplant is reliable, the other stuff won’t help much. 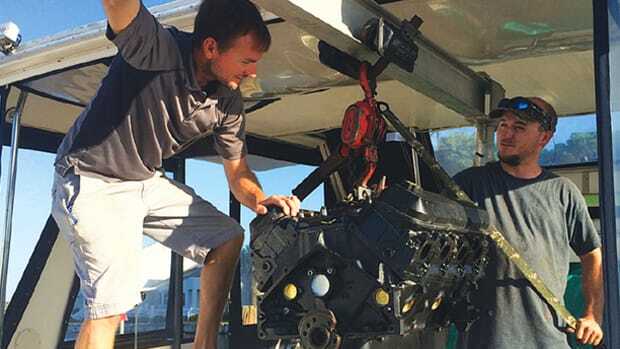 Swapping tired engines for fresh ones is a straightforward, albeit comparatively expensive job, but one that’s like giving your boat a whole new lease on life. If you can’t rebuild your old engines, choose new ones similar to the old, so you have to change as little as possible. Re-engineering the motor mounts, exhaust system, fuel lines, cooling system, etc., adds complexity and expense. If you’ve got a solid hull and good engines, you can use your boat on the weekends while the yard works on the other jobs during the week. 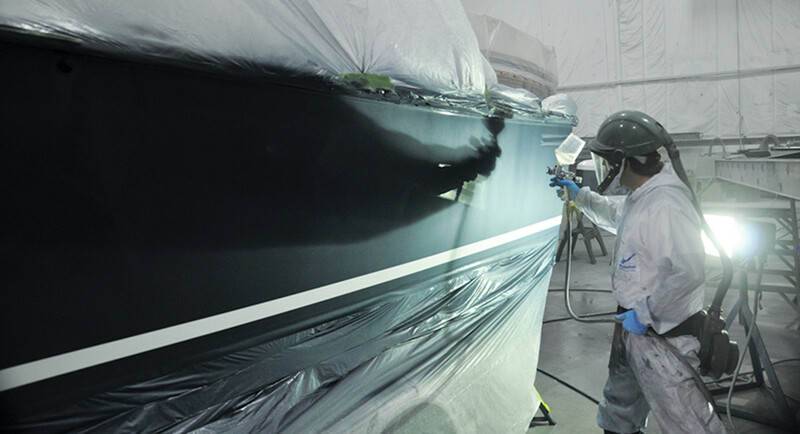 Before long, your boat will be as good as new, and maybe better. You’ll wonder why you ever considered selling her in the first place. When a press release for MagicEzy Hairline Fix (www.magicezy.com) arrived in my inbox the other day, I thought it was a miracle treatment for my rapidly broadening forehead. 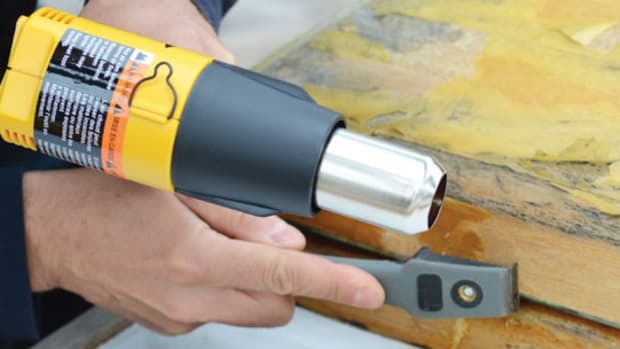 But it’s something even more important, and if it works like the company says it does, we should all be carrying tubes of the stuff in our toolboxes. 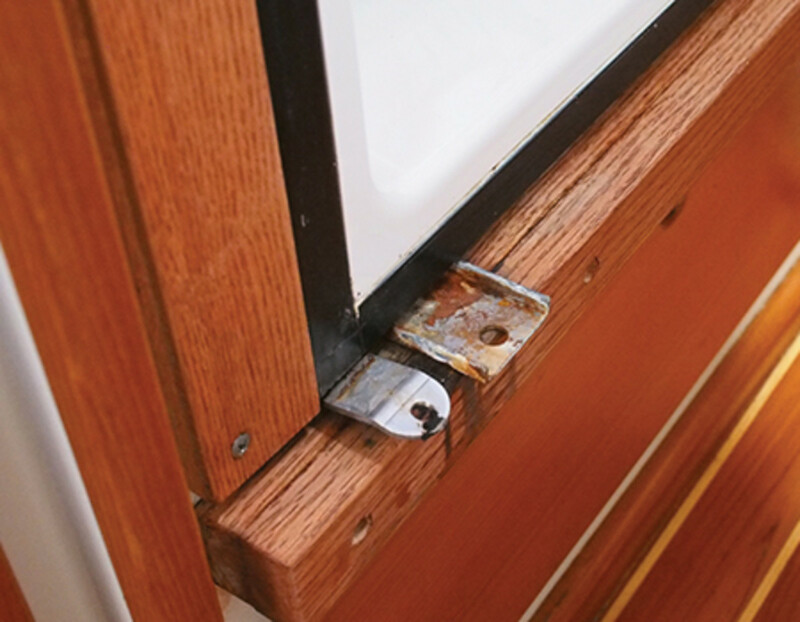 Repairing hairline cracks and crazing in gelcoat is a pain in the transom, which explains why most people don’t do it. But MagicEzy supposedly makes it easy (or is it Ezy?). The traditional way to fix crazing is to first widen the crack slightly into a V-shape with a scraper, screwdriver, or other appropriate tool. Then you vacumn up the dust, clean the widened crack with solvent, and fill it with repair gelcoat. (Some people fill the crack with resin first, let it cure, then sand it and apply the gelcoat. Unless the crack penetrates into the laminate, I don’t think this is necessary.) When the gelcoat hardens, wet-sand it smooth, and wax it to bring back the polish. It’s not rocket science, but still…. MagicEzy comes in 11 colors. It’s nontoxic, non-hazardous, and UV- and water-resistant, according to the manufacturer. Repairs are guaranteed for up to three years. I haven’t actually used the stuff myself at this point, but one of our editors will soon give it a go and report back in an upcoming issue of Power & Motoryacht. Let’s hope it works as advertised. With a price of just $25 per tube, and an application regime that sounds fast and painless, MagicEzy could well mean the end of hairline cracks for good. 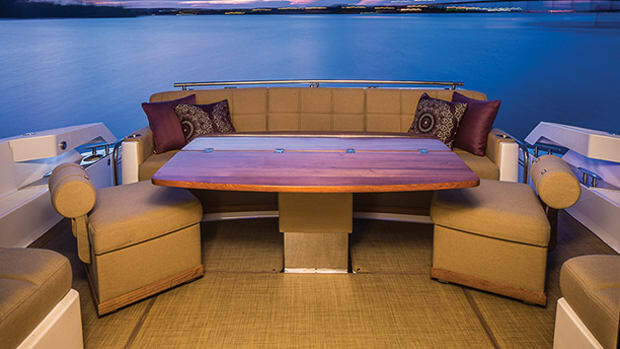 Flipping demands a plan, too: What you really want to do is spend as little as possible to make your boat attractive to buyers, which basically means cleaning and polishing, removing extraneous clutter, and maybe adding a decorative touch or two to the cabin to appeal to aesthetic sensibilities. Other than safety issues, forget about making costly repairs—most likely, you won’t get the money back with a higher sale price. Instead, renegotiate the offers you get based on the buyer’s survey, and let the new owner deal with the major repairs. It’ll be cheaper and less hassle for you. And, beyond everything else, be sensible. Make absolutely sure a prospective owner knows about repair problems that, if left unattended, could result in fire, explosion, sinking, or other tragedies. Sometimes surveyors miss things, especially things that appear only when the boat’s underway—like leaky fittings, for example, or engine-load issues. Maybe the principle of caveat emptor protects you from liability (maybe it doesn’t; ask your lawyer), but full disclosure’s the decent thing to do, and will improve your karma. If you’ve decided to flip, go to the boat tests on this website and start looking for your next command. 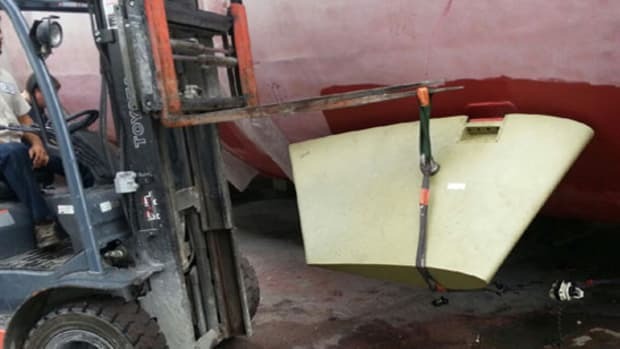 There are about a million boat tests online, too, going back many years, so if you’re shopping the brokerage market, you can find reports written when those boats were new. In addition to this website, check out David Pascoe’s reviews at www.yachtsurvey.com. 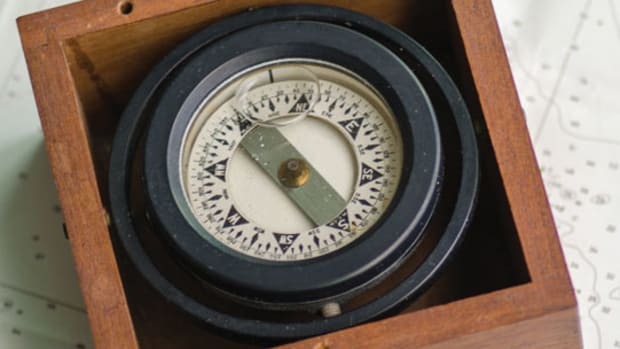 A surveyor with many years’ experience, Pascoe offers lots of other information of interest to boat nuts of every variety. I snoop around on his site all the time. Whatever choice you make—fix it or flip it—you’ll enjoy boating more, minimize maintenance and repair costs, and maximize your pleasure-to-dollar ratio once you’ve achieved the right goal for you. It’s a win-win situation.